When in the throes of the business atmosphere, one needs to keep their bottom line in their vision as well as the costs that may or may not be incurred to their business associates and clients. One such mechanism that can aid in the value and cost analysis is the value analysis calculator. These instruments cut to the bottom line and also show where savings can be garnered. 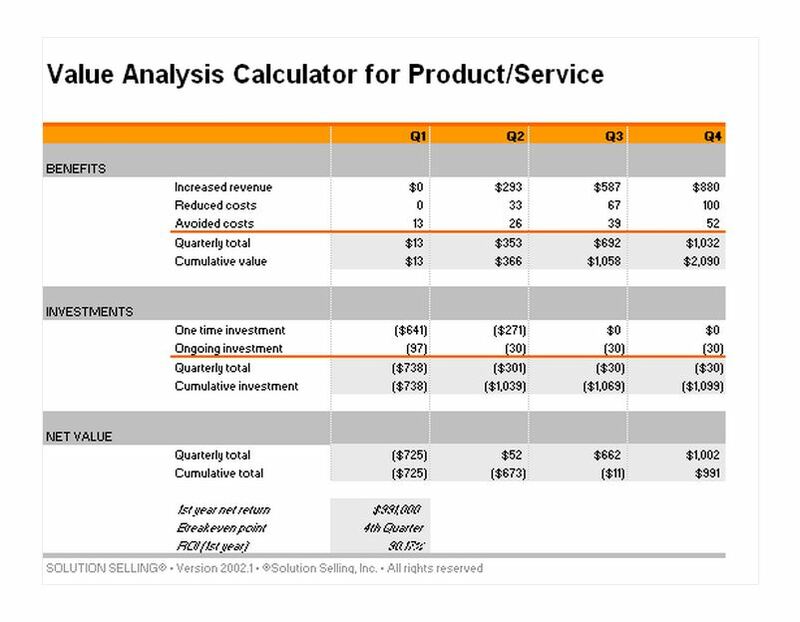 A value analysis calculator template is an easy way to calculate these costs. This instrument is a valuable way to save money, time, and business relationships. It also allows the business to see a snapshot of how they are doing and what strategies they want to take in terms of their future health and marketing strategies. The first step in using the template is to download it off this page. After downloading, the value analysis calculator will then offer some choices like shading of cell, cell size, and different calculations that can be obtained and used. The second step is to begin entering the information into the appropriate cells on the template. Some of the available cells include increased revenues and reduced costs in the benefit section of the analysis template. One can also enter such things as one time investments and ongoing investments that will have an impact on the general financial health of the company. Why Use the Value Analysis Calculator Template? The most obvious reason why a company would use the value analysis template is that it is easy to use. Simply pull up a format that suits the need and enter the information. The template will allow the individual to show an overall snapshot of the financial health of the company as well as it is easy to read. Another benefit of the template is that it is free. Formulated according to standard business practices, as well as free to access and use makes it the perfect template for complicated business analysis. The template also allows the user to customize it to the specific company or add or subtract colors, cells and categories.